When it comes to pool building, you’re only limited by your imagination. 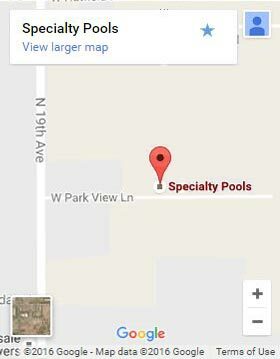 You need a company that can turn your visions into a reality, and that’s where Specialty Pools shines. We’ve designed and constructed hundreds of pools for local homes and business in the area. As your swimming pool contractors in Mesa, our focus is on designing a pool that doesn’t just meet your needs, but your vision as well. That’s why we work closely with you throughout the design and installation process. Our inspiration comes from your ideas, our designers model them, and our builders make them a reality. Now is the time to get the pool you’ve been dreaming of. A pool building consultation: Our designers will map your property, discussing what you want from your pool. Your unique landscaping will help determine available options, and we’ll take every factor into consideration. That leads directly into the modeling stage. A 3-D modeled design: We 3-D model our designs before creating a final blueprint. This gives you a visual representation of the layout. We’ll include your property and building dimensions as well, making it easy to make the changes you want. Pool construction: We construct pools using high-grade materials. These don’t just provide a gorgeous look and feel, they last longer. Our materials are resistant to the hot Phoenix sun, and as a specialty builder, each one of our employees is an expert in their field as it relates to swimming pool construction. Now is the right time to begin building or remodeling your dream pool. Not only will you have a relaxing oasis right in your backyard, our pools increase the value of your property. Get ready to enjoy your new swimming pool, and call or contact us today to start the pool building process.